When he had finished speaking to Saul, the soul of Jonathan was knit to the soul of David, and Jonathan loved him as his own soul. And Saul took him that day, and would not let him return to his father's house. Then Jonathan made a covenant with David, because he loved him as his own soul. And Jonathan stripped himself of the robe that was upon him, and gave it to David, and his armor, and even his sword and his bow and his girdle." "You son of a perverse, rebellious woman, do I not know that you have chosen the son of Jesse to your own shame, and to the shame of your mother's nakedness?" Storming out of the Palace, Jonathan goes to find David, who has hidden himself behind a heap of stones in a field. Seeing Jonathan, David "fell on his face to the ground, and bowed three times; and they kissed one another, and wept with one another, until David exceeded [himself]. After swearing that "the Lord shall be between me and you, and between my descendents and your descendants, forever," the two part. "How are the mighty fallen in the midst of battle! Jonathan lies slain upon the high places. I am distressed for you, my brother Jonathan; very pleasant have you been to me; your love to me was wonderful, passing the love of women." So what is this? A Lost Manuscript by Shakespeare? A Gay Teen Novel from the middle ages? Actually, It's from the OLD TESTAMENT - The "Bible." Saul was the King of Israel. Jonathan, the King's son, loved David. And David, the famous warrior, loved Jonathan. And yeah, it's the same David who slew the Giant Goliath with his slingshot, and who ended up the greatest King of Israel, and was an ancestor of Jesus. Oh, and the phrase "passing the love of women" became code, in the middle ages and after, for love between men. 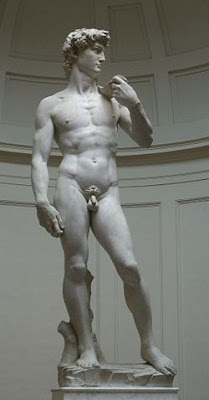 And gay artists like Donatello and Michelangelo (yup, THAT Michelangelo) made DAVID their ideal of youthful male beauty. And yes, it's THIS David.